2018 was a year filled with truly incredible, gorgeous, special weddings — that’s for sure! Lauren and Grant’s Goldsboro, North Carolina wedding was on for the books, and I am so excited to share the images from their wedding today. In every single way, this was one wildly meaningful, Christ-centered, stunning, joy-filled wedding for a couple whom I adore tremendously. 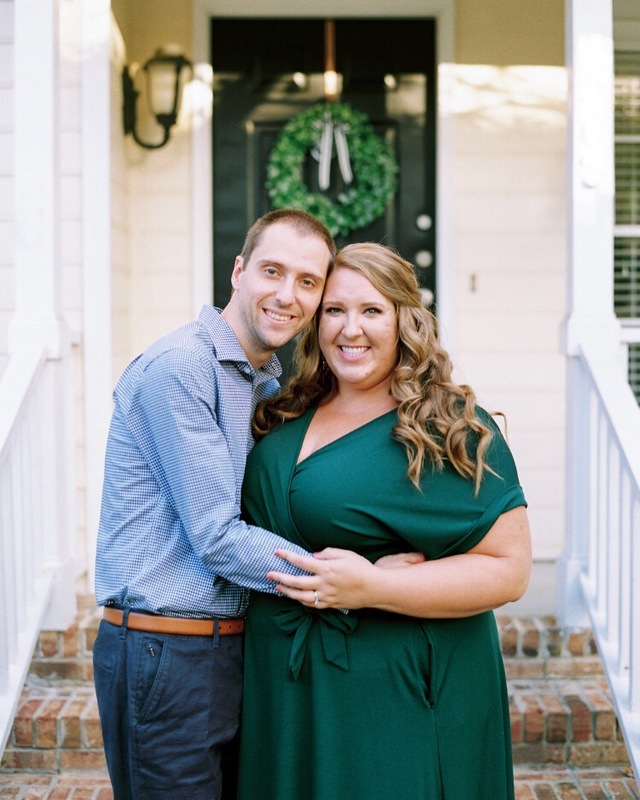 Lauren and Grant chose to be married in their hometown, and they also chose to hold their reception in the newly renovated and historic Firehouse in downtown Goldsboro. Not only were they the very first wedding in this space (so cool! ), but the owners of the venue are dear friends of the bride and groom. It felt like such a hometown celebration of love in all the best ways, and what a monumental, happy, and beautiful day it was as Lauren and Grant became Mr. and Mrs. Sasser in front of all of their loved ones! Lauren reached out to me days after they were engaged (which was an unbelievable honor + blessing! ), and we’ve been busy planning and designing their dream wedding day for almost a year now. Lauren and Grant have been dating for over six years, and they were so, so unbelievably ecstatic to marry one another – and to celebrate their loved with their treasured family and friends. If you know these two at all, you know just how important their faith is to them, as well as how much they value the relationships in their lives. Lauren and Grant exude graciousness, love, and fun, and their wedding day was so beautiful, so joyous, and filled with an incredible amount of love. Who they are as individuals and as a couple was reflected in each and every detail and element of design that we planned and brought to life, and these two wanted a day that brought full glory to God, that celebrated their commitment, love, and vows to one another, and that generously celebrated their family and friends. There were countless memorable moments throughout the day that are so vivid in my memory, and it was so sweet to witness so much love and excitement surrounding these two. Their bridesmaids and groomsmen are such amazing friends to them, and you can easily tell just how loved they are. From all of the girls getting ready together to opening the most generous gifts from her girls to seeing her bridesmaids’ reactions when Lauren revealed her stunning wedding dress to her best friends to Lauren and her dad’s first look to Lauren and Grant praying together before the ceremony (without seeing one another!) to Lauren reading aloud her card from Grant to the bridesmaids prayer before the ceremony and then to their incredible ceremony and reception… these moments and memories will be ingrained in their minds forever – and captured exquisitely by Ally and Bobby and also by Muddy Trail Films! (These two husband and wife teams are truly incomparable, and I adore when we get to work together. Having vendors who love their couples and love their jobs so well is where the magic happens, and it’s always an honor to work with these two teams!) The entire day was truly overflowing with excitement and joy, and it’s such a sweet reminder of what weddings are really about: marriage and all of the days that are to come – together as husband and wife. This is just a recap of some of my favorite parts of their wedding day, but you can be sure that we have so many more stories, moments, and memories to share, as it was such an amazing day from start to finish. It was also pretty awesome to be the very first wedding or event in the brand-new cocktail hour and reception space at The Firehouse in downtown Goldsboro. This venue was completely renovated, and it was the perfect spot to bring their wedding the life. I couldn’t be more in love with this wedding design we dreamed up over the last year for Lauren + Grant’s epic wedding! Lots of organic touches, soft greys with plenty of white, brass, and black, abundant greenery, gray taper candles, and so many personalized, meaningful touches scattered throughout. And filling this space with almost 200 of their closest family and friends?! Priceless. It was the most perfect fall day – sunshine, a cool breeze, and the most magnificent sunset to cap it all off. They ended the evening with Krispy Kreme donuts (their fave!) and a romantic, jubilant sparkler exit! It was a marvelous night in every way!! Endless thanks to a dream team of vendors who worked tirelessly to bring this all to life (including my three wonderful assistants!). Happy, happy wedding and MARRIAGE to the incredible Mr. and Mrs. Sasser! Goodness, as you can see, I couldn’t begin to narrow down images from their marvelous wedding day. I am so, so grateful to Lauren and Grant for entrusting their wedding to me, and it was such a deep joy and honor to be a part of such an exciting season and joyful day. These two are so deeply love by countless people, and it’s easy to see why — their hearts of gold are so evident, and they love big. It takes a village, and I am so deeply grateful to every person who poured their heart into bringing this wedding to life for a couple that we all love and adore so much.